Employee wellbeing is increasingly a focus of government attention in the UK and elsewhere. It is viewed as a legitimate target of government policy in its own right, but there are also reasons to think that improvements in employees’ wellbeing may be conducive to economic growth. This paper focuses on the the subjective wellbeing of employees and its potential impact on workplace and organisational performance. As yet there is relatively little empirical evidence on the relationship between employees’ subjective wellbeing and workplace performance. This paper begins to fill that gap for Britain by carrying out a literature review and new empirical analyses. The term subjective wellbeing (SWB) is used to cover a number of different aspects of a person’s subjective mental state and has been defined by the OECD to include “all of the various evaluations, positive and negative, that people make of their lives, and the affective reactions of people to their experiences”. For many years, policy makers focused on GDP growth as the best means of securing a better quality of life for citizens. But governments and their advisers have recently turned their attention to other measures, including of individuals’ subjective wellbeing. One of the motivations has been research indicating that citizens in developed economies have not necessarily become ‘happier’ as a result of increased prosperity. • How do we measure and define wellbeing in the workplace? • What employee and job characteristics influence wellbeing in the workplace? • What employer practices have the greatest positive impact on wellbeing in the workplace? • Is there any evidence to link employee wellbeing and business performance? The study consisted of three main substantive stages. In the first stage of the study, we sought to develop a conceptual framework around SWB and its possible links to workplace performance. Within this conceptual framework, we sought to describe the different approaches to the definition and measurement of SWB, drawing heavily on the existing psychological literature which points to its multi-dimensional nature. The framework also considered the factors that affect employees’ levels of SWB at the workplace. It then went on to consider the potential ways in which employees’ SWB might affect their job performance, and the likelihood that such effects will aggregate in such a way as to form a causal link between employees’ SWB and the overall performance of their workplace or firm. ~ and whether employees’ SWB has a causal impact on individual or workplace performance. The third and final stage of the study involved new empirical analysis of the links between employees’ SWB and workplace performance, based on the 2011 Workplace Employment Relations Survey (WERS). These linked employer-employee data contain multiple measures of employees’ SWB and provide the basis for a robust investigation of the SWB-performance link in British workplaces. Using various multivariate regression techniques we sought to isolate the independent relationship between SWB at the workplace and workplace performance. How do we conceptualise and measure wellbeing in the workplace? There are two broad – but complementary – approaches to the conceptualisation and measurement of SWB. Hedonic approaches focus on the type of affective feelings that a person experiences (e.g. anxiety or contentment) and also on the adequacy of those feelings (e.g. whether the person is satisfied with a certain aspect of their life). 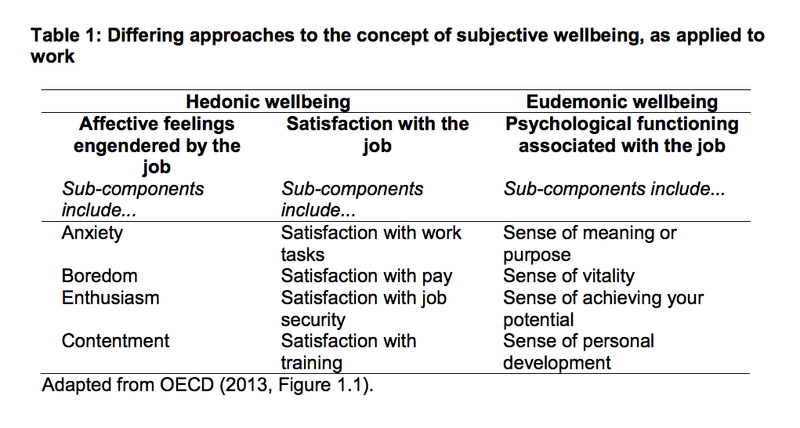 A second hedonic approach to SWB focuses on the adequacy of one’s affective feelings towards aspects of the job, asking (for example) how satisfied a person is with the work they do or the pay they have received (see column 2 of Table 1 below). Feelings of satisfaction tend to be correlated with the pleasant-unpleasant dimension of job-related affect shown in Figure 1 above (see Weiss et al, 1999) and so there is some relation between the two hedonic approaches. However, the important distinction in the ‘satisfaction-based’ approach to SWB is that it involves an implicit comparison with some alternative state (for example, the features of that job in a prior period, or the features of jobs held by other employees). Whilst a focus on the type of job-related affect may therefore arguably give a more direct indication of an employee’s core feelings at work, a focus on job satisfaction can be particularly informative as it indicates how the employee evaluates those feelings. Such evaluations may factor into the employee’s decision making – for example whether to begin the search for an alternative job (see Green, 2010). This is potentially significant, since attitudes are usually described as having three components: affective, cognitive and behavioural, which are reflected in feelings, beliefs and actions. For Warr, there is then an “action-tendency” embodied within the concept of job satisfaction that is not present in core affect. In other words, one can expect job satisfaction to have a greater influence on an individual’s actions or behaviour. health (e.g. the extent to which they feel a sense of purpose). The eudemonic approach therefore starts from the position – derived from psychological and philosophical literature – that some actions or personal states are more appropriate or worthwhile than others, and views SWB primarily in terms of self-actualisation and virtuous behaviour (psychological ‘flourishing’) rather than in terms of self-gratification. The essential distinction from the hedonic approach can be illustrated by reference to an employee who, like a parent, may find their role stressful and be dissatisfied with its financial rewards, but who may nevertheless gain a strong sense of purpose from that role. The three differing approaches to the concept of SWB illustrated side-by-side. Most research into employees’ SWB has adopted the hedonic approach, with job satisfaction being the most frequently studied aspect of job-related SWB. The study of job-related affect has a more recent history, but a growing body of empirical research investigates this dimension of SWB. The eudemonic approach to SWB has been less frequently operationalised in organisational research. The term SWB is used hereafter as a catch-all for research in any of these three areas, although the focus of particular research studies is highlighted within the main body of the report. What employee and job characteristics influence SWB in the workplace and what employer practices have the greatest effect? An individual’s SWB at work is influenced both by their own characteristics, and those of the job and workplace in which they are employed (see Figure). • a perception of significance, both in terms of the significance that the job has for the worker, and the perceived value of the job to society. SWB tends to be lower when the demands of the job are particularly high. Job demands result not only from the amount or type of work, but also from any incompatibility with pressures from outside of work. These relationships are fairly well-established in the existing literature. Employers therefore have the potential to influence the SWB of their employees through changes in job design. The picture has its complexities, however. An employee’s SWB will reflect not only the actual characteristics of their job, but also the value which they place upon them. In a similar way, individuals differ in their expectations; if an individual has lower expectations of their job, they may rate their job satisfaction more highly than someone who expects more from their work. This has the implication that, in thinking about job and workplace changes that may raise SWB, employers and policy makers need to bear in mind that there may be differing effects for different employees. Any analysis of the factors driving SWB at work therefore needs to take account of individual traits as well as job and workplace characteristics. • Practices which aim to give employees more involvement may raise autonomy, but may also increase the level of demands placed on them. • Practices aimed at raising the SWB of one group of employees within a workplace may do so to the detriment of others (e.g. if they give rise to perceptions of unfair treatment amongst those who are not covered by the practice). • Practices may have differing effects on SWB dependent on workplace characteristics (e.g. formal arrangements may be better received in larger workplaces than in smaller ones). Much of the literature in this area relates to the impact of systems of human resource management (HRM) practices on SWB; here the evidence is inconclusive. Evidence for the UK to date points to a positive correlation between HRM and the job-related anxiety measure of SWB, but also a positive, or at least neutral, impact on the job satisfaction measure of SWB. However, it is clear that there is a case for more robust studies of the impact of employer practices on a range of aspects of SWB. How can SWB affect workplace performance? There is a considerable amount of evidence to indicate that there is a positive association (a correlation) between SWB and an employee’s job performance. Moreover there is some evidence which indicates that higher levels of SWB may lead to (cause) higher levels of job performance in some circumstances. 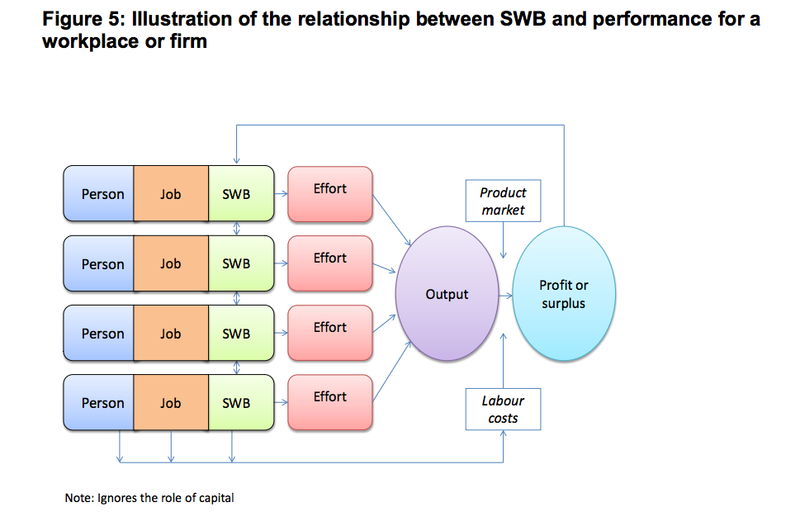 The empirical literature indicates three causal mechanisms through which higher levels of SWB can bring about higher job performance. The first is by affecting employees’ cognitive abilities and processes – enabling them to think more creatively and to be more effective at problem-solving. The second is by affecting employees’ attitudes to work – raising their propensity to be co-operative and collaborative. The third is by improving employees’ physiology and general health – improving their cardiovascular health and immunity, enabling speedier recovery from illness, and securing greater levels of energy and potentially effort. There is not necessarily a straightforward link between an employee’s SWB and their job performance, however. For example, raised levels of creativity and improved social interaction is only likely to generate better employee performance in jobs with a substantial degree of autonomy and those that involve team work or customer interaction. In addition, it is possible that employee behaviours or work attitudes may be most heavily affected when levels of SWB are particularly high or particularly low. There is a need for further examination of the links between SWB and employee performance in real world settings to address these issues. There are also reasons to think that the relationship between SWB and job performance at the level of the employee may not necessarily be replicated at the level of the workplace. One reason is that low levels of SWB among a small number of workers may spill over to negatively affect levels of SWB (and thus levels of job performance) among the wider workforce. 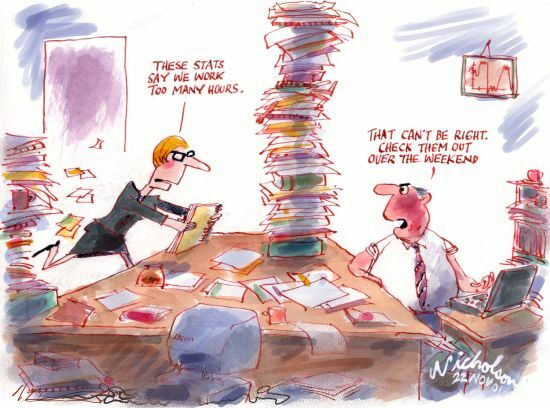 Another relates to the differing contributions workers make to workplace output, because of variations in their ability and their span of control; the contribution of all workers may not matter equally for the performance of the workplace, and so it may matter who has high or low SWB. Whilst there are some studies which do show a robust causal impact of employees’ SWB on the performance of the workplace or firm, the evidence is more limited at this level. in order to generalise beyond the small number of existing studies. Statistical analyses were conducted using the 2011 Workplace Employment Relations Study to explore the relationship between SWB and performance at workplace level, thereby contributing new evidence to the literature. The level of employee SWB in the workplace was measured in terms of the two most studied aspects of SWB: job satisfaction and job-related affective feelings (WERS did not collect eudemonic measures of SWB). WERS measures nine dimensions of job satisfaction (pay, sense of achievement, training receipt, job autonomy, skill development opportunities, job security, scope for initiative, involvement in decision-making and their satisfaction with the work itself). It contained six indicators of job-related affect, covering the frequency with which the employee feels tense, depressed, worried, gloomy, uneasy and miserable. Workplace performance was measured using the manager’s subjective assessment of the workplace’s performance relative to the industry average on three dimensions: financial performance, labour productivity and the quality of the output/service. An additive scale formed from these three individual measures was used as a fourth measure of performance. The analysis was carried out using data from workplaces that took part in the 2011 WERS (the cross-sectional analyses) and workplaces that took part in the 2004 WERS and were followed up in 2011 (the panel survey). The cross-sectional analyses examined the extent to which a workplace’s performance in 2011 could be accounted for by the level of employee SWB at the workplace in 2011. The panel analyses explored whether changes in workplace performance between 2004 and 2011 were linked to changes in the level of employee SWB at the workplace between those two years. The panel survey also assessed whether the level of employee SWB in 2004 was predictive of workplace closure by 2011. The analyses showed a clear, positive, statistically significant relationship between the average level of job satisfaction among employees at the workplace and workplace performance. This finding was present in both the cross-sectional and panel analyses and was robust to various estimation methods and model specifications. Employee job satisfaction was found to be positively associated with workplace financial performance, labour productivity and the quality of output and service. Workplaces experiencing an improvement in job satisfaction – whether measured in terms of the average level of satisfaction in the workforce, or measured in terms of an increase in the proportion “very satisfied” or a reduction in the proportion “very dissatisfied” – also experience an improvement in performance. By contrast, there was no association between job-related affect and workplace performance. These findings are significant because this is the first such study for Britain. • The average level of job satisfaction among employees at the workplace was positively related to all four workplace performance measures. • Workplaces with “very satisfied” employees had higher labour productivity, higher quality of output, and higher overall performance. Workplaces with “very dissatisfied” employees had lower financial performance and lower overall performance on the additive scale. • Non-pecuniary aspects of job satisfaction were positively correlated with overall workplace performance, the quality of output (and, less robustly, with labour productivity) whereas pay satisfaction was positively associated with workplace financial performance but not with other performance measures. • Job-related affect was not correlated with workplace performance, regardless of the measure used. • Increasing overall average employee job satisfaction was associated with increases in all four workplace performance measures. • Increasing average non-pecuniary job satisfaction was positively associated with changes in all four workplace performance measures. Increasing pay satisfaction, on the other hand, shows varied associations with the performance measures, depending on the model specification, but it is never positively associated with performance measures. • Workplaces with rising job dissatisfaction experienced deterioration in all four performance measures, whereas workplaces with an increase in “very satisfied” employees experienced rising quality of output or service and an increase in the additive performance measure, but not financial performance or labour productivity. • Changes in job-related affect were not associated with workplace performance, regardless of the measure used, although there was some evidence that an increase in employees reporting “ill-being” most or all of the time was associated with deteriorating quality of output or service and a decline in the additive performance scale, at least in some models. These findings are consistent with the proposition that employers who are able to raise employees’ job satisfaction may see improvements in the performance of their workplace. These improvements are apparent in profitability (financial performance), labour productivity and the quality of output or service. Although we cannot state definitively that the link is causal, the findings are robust to tests for reverse causation and persist within workplaces over time, so that we can discount the possibility that the results are driven by fixed unobservable differences between workplaces. Thus the results are consistent with the causal relationship suggested by conceptual work in this area. What are the implications of the study’s findings for policy makers and employers? First, there is a prima facie case for employers to consider investing in the wellbeing of their employees on the basis of the likely performance benefits. 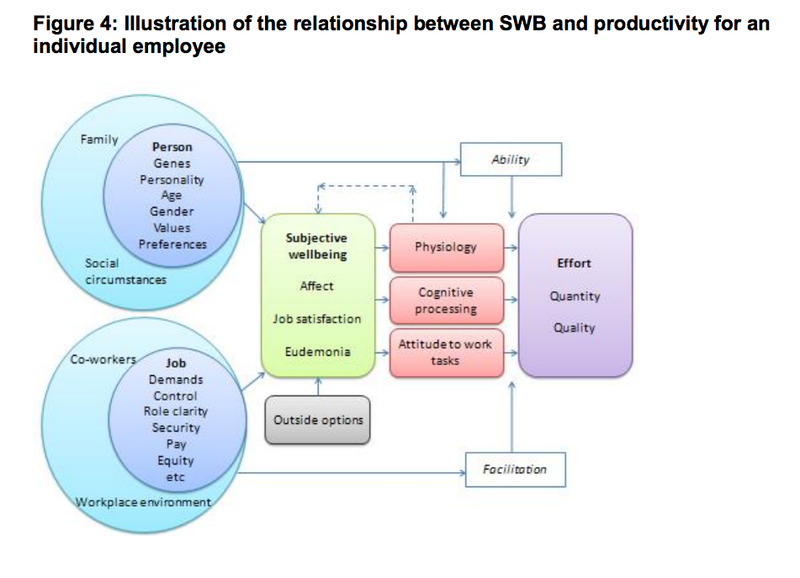 The study sets out a conceptual framework indicating the ways in which raising employees’ SWB may improve performance, and also presents evidence which is consistent with there being a causal relationship between the two. Specifically, if the average employer is able to raise their employees’ SWB, the theory and available evidence suggest that they are likely to see improvements in the performance of their workplace. It should be noted, however, that the evidence of a causal link between the job-related affect measure of SWB and workplace performance is limited, and indeed the WERS analysis conducted here finds no such association. Thus there appears to be no clear case yet for employers to invest in that dimension of employee wellbeing – although equally we find no clear disadvantage to doing so. Equally, there are likely to be routes to commercial success that employers can pursue without regard to employees’ SWB. We find no link between employees’ SWB and workplace closure probabilities, suggesting workplaces can continue to trade and, perhaps even prosper, whether employees’ SWB is high or low. Thus the “low road” may be a viable option for some employers, although we do find clear evidence that an increase in job dissatisfaction within a workplace is linked to deteriorating workplace performance. There is, of course, also a rationale for promoting employee SWB based on benefits that go beyond the private returns to employers, since the wider society can benefit from citizens who are “happier”. There are spillovers to employees’ family life, their participation in social activities and their consumption of government services (most obviously welfare services and health care). A higher level of job-related SWB might then be considered a goal in itself – a point reflected in broader arguments about moving beyond purely economic measures such as GDP when considering levels of national progress. Nevertheless, judging by the descriptive information presented in Appendix C of this report, most employees in Britain appear reasonably satisfied with most aspects of their jobs and they are not suffering in large numbers from particularly adverse SWB. The percentages saying they are depressed or anxious most of the time are low. As regards policy responses, it is apparent from the literature review that we do not yet fully understand what it is about jobs and the working environment that change employees’ SWB. Some things we know quite a lot about. For example, higher pay leads to higher job satisfaction, but even here the relationship is not linear, tailing off at higher pay levels. 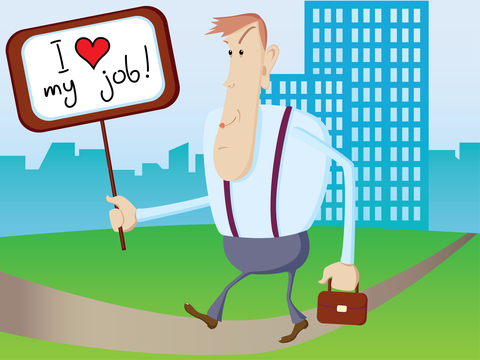 The complexity of the job satisfaction concept is illustrated by the pay satisfaction literature which emphasises the importance not only of pay levels but also pay relativities. Moreover, even if employers and policy makers were to promote certain policies or practices that, on average, engender greater employee SWB, this does not mean that this will lead to improved SWB everywhere or that, even if it did, this would translate into improved workplace performance for all. There is likely to be substantial heterogeneity across workplaces and employees such that different policies might work better for some employers than others. Policy initiatives should therefore be carefully evaluated so that this heterogeneity can be better understood. It is generally accepted that success makes people happy, but we have argued that there are good reasons to expect that causality can run in the other direction, such that employees with higher SWB will perform at a higher level in their jobs and, moreover, that inducing higher SWB among employees has the potential to raise their performance. The possible mechanisms through which this effect might arise include positive effects of SWB on employees’ health, cognitive processes and attitudes to work tasks.